There is no fixed time that we can give, but a typical straightforward installation should not take more than half an hour. In more complex cases when we need to remove the existing TV, do connections, run wires etc, the installation may drag to up to 2 hours. Is the installation safe and secure? We are a HILTI-certified company with more than 5 years of experience in this industry, as well as being appointed as Sony and Philips official TV installation company for their end consumers. All our installers go through a mandatory 1 month orientation course before they are allowed to do any installations for customers. We also have 2 years warranty for our workmanship. Therefore, rest assured that your installation is in safe hands. What are the benefits of mounting a TV? Mounting the TV on the wall has several advantages. Firstly, it saves the hassle of having to purchase an additional console. This will allow your home to be much bigger. Secondly, there will not be the risk of having you’re the TV accidentally toppling over due to negligence as we ensure that your TVs are fastened to the bracket. Lastly, the array of brackets on offer from tilting to swivel types means that you have an additional dimension to the possible viewing angles in your home! I made an appointment to install my TV. However, I need to cancel it, Are there any charges? No. We do not have fees for any last minute cancellation as we understand that unforeseen circumstances may arise. I realise that my TV is not straight/slanted after the installation. Will there be any extra charges for a follow up call? In such scenarios, we will arrange a FOC follow up call to your place to check the bracket and TV and see what needs to be rectified and adjust accordingly. Thus, we will not charge any fees. Does the brackets have any warranty? Yes. 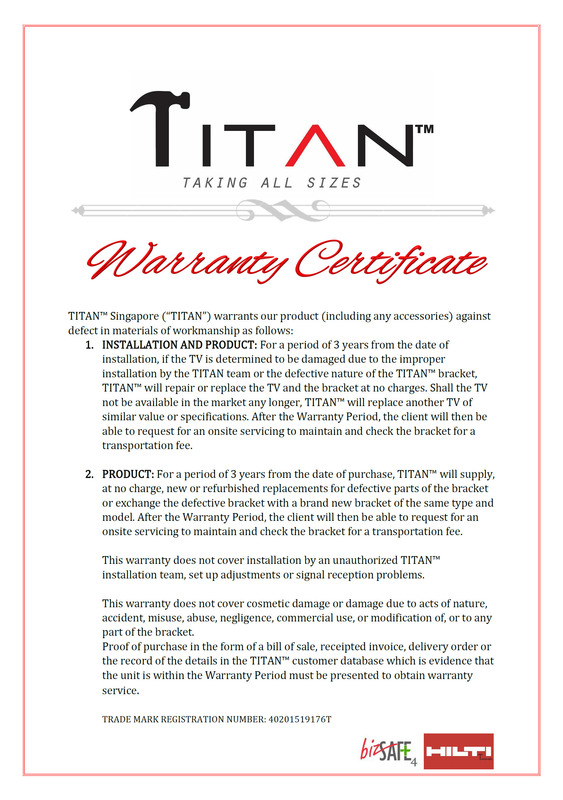 All our products and workmanship comes with 2 years international warranty. What kind of walls are suitable for mounting? We have certain requirements before we mount on walls like partition walls. Please click here to view our table. I need a more specific timing for installation slot. Can it be arranged? Unfortunately, we are unable to give a specific time due to the nature of our job, in which many type of circumstances may arise like traffic jams, accidents etc. We do not want to over promise our customers and give you a specific time only to fail to meet it. As such, we always recommend 3 hour time frame in order to ensure minimal disruption. Product does not match the required specifications or descriptions. Item is damaged or defective upon delivery of goods. The wrong item has been delivered. Original receipt/proof of purchase has to be presented. Goods must be in new condition in its original packaging with all existing accessories (manual, screws etc) intact. Sealed items in the packaging cannot be opened. If in any case the sealed items are opened (i.e packets of screws), we reserve the right to reject the return/refund on a case by case basis. If the above conditions are met, please have your item and invoice ready and proceed to our showroom at 25 Ubi Road 4 #02-01 S(408621) for the process of your return/refund. We will only refund the amount paid for the item. The delivery fee (if applicable) is non-refundable.